The Picardy Spaniel is one of several French spaniels, a gundog which is used for flushing prey. They search for game birds, which in turn panic when found and appear for the waiting hunter. Once the prey has been shot they will retrieve the birds on command. Originally they were developed to hunt for ducks on marshy lands, but it is happy hunting any birds over any terrain. An ancient breed, the Picardy Spaniel was originally developed in northern France and has been known since the 14th century. 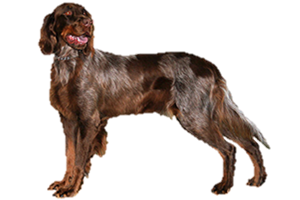 This breed was once considered as a variety of the French Spaniel and is a close relative to the Blue Picardy Spaniel. Is the Picardy Spaniel Right for You?